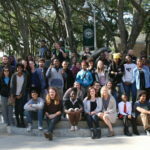 The results of both approaches were on display on the same day recently as Jacksonville University students connected with youths from Arlington and other area schools to culminate their mentoring together and give them a taste of campus life to boot (see photo gallery below). 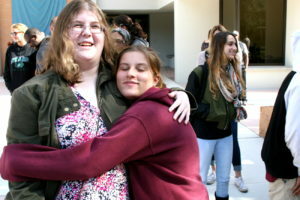 JU student April Lantz (left) gets a hug from her mentee, 15-year-old Terry Parker student Angelica Castleberry. 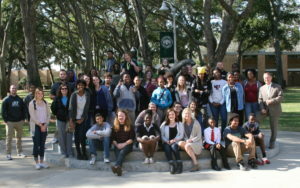 More than two dozen of Sociology Professor Shelley Grant’s Media and Crime students met up Thursday, Dec. 8, for lunch and campus tours with their semester-long mentees from Fort Caroline Middle School, Arlington Middle School and Terry Parker High School. Meanwhile, students from five Duval County middle schools (DuPont, Arlington, JEB Stuart, Ribault and Jefferson Davis) participated in “A Day in the Life of a JU Dolphin,” a collaborative event between JU Student-Athlete Services and the 5000 Role Models of Excellence program of Duval County Public Schools. 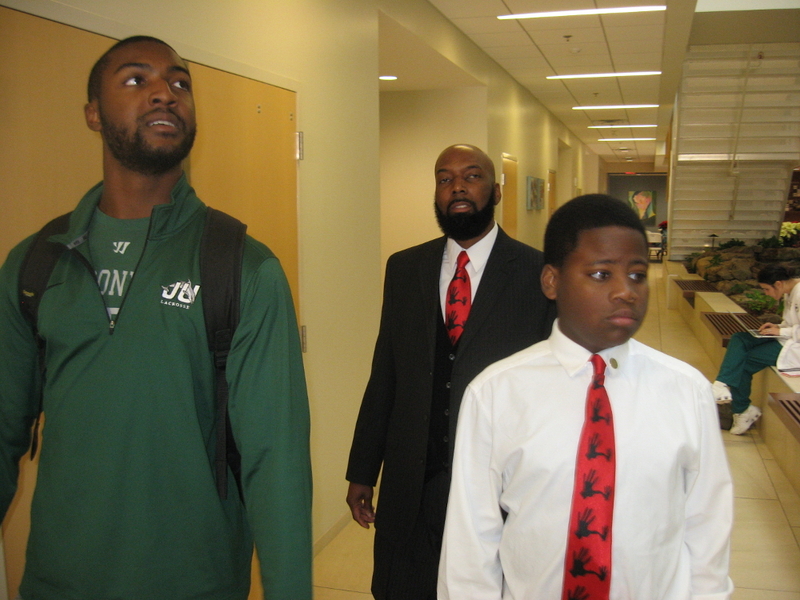 JU lacrosse player EJ Thurmond (left), mentee Christopher Francois and Thaddeus Polite of Arlington Middle School tour the Brooks Rehabilitation College of Healthcare Sciences as part of 5000 Role Models of Excellence. 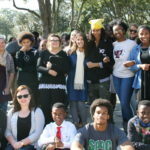 Now in its fifth year, the service-learning aspect of Grant’s class in the College of Arts and Sciences partners her students with mentees who are part of the Communities in Schools Jacksonville dropout prevention program and may have dealt with emotional, family, legal or other troubles. 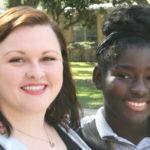 Grant’s coursework helps prepare her college students as they learn community perceptions of the criminal justice system and of those who violate the law, with special emphasis on juvenile justice and juvenile offenders. Their mentoring helps dispel common myths and stereotypes regarding youths and delinquency, and they get to have a voice in the community’s perception of juveniles. 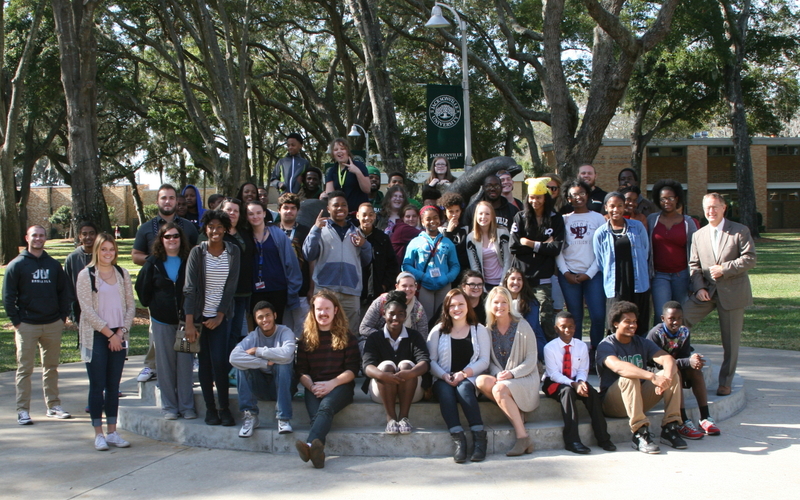 JU students and their mentees gather before lunch with Sociology Professor Shelley Grant, Senior Vice President For Academic Affairs/Provost Dr. Donnie Horner and Duval Schools officials. April Lantz, a sophomore Psychology major who plans to become a school counselor or therapist, said she will never forget the one-on-one relationship she was able to build. 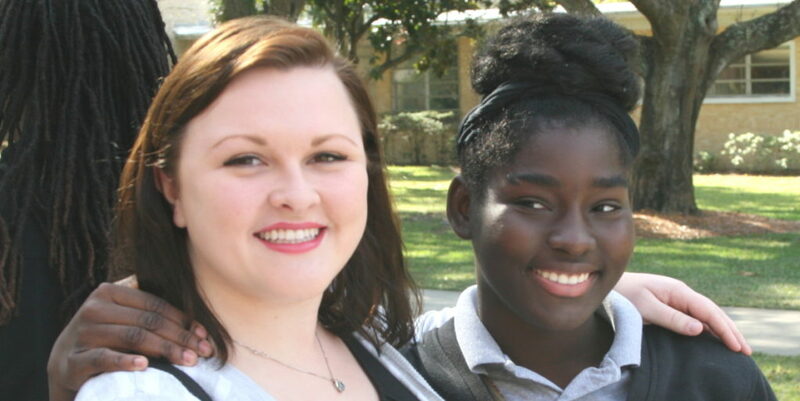 Her mentee, 15-year-old Terry Parker student Angelica Castleberry, won’t soon, either. Dane Gilbert, director of case management for Communities in Schools and a 1979 JU Physical Education graduate, has monitored the benefits of Grant’s mentoring project over the years and has seen the positive impact a caring adult can have on a student who may not otherwise be considering life goals such as attending college. 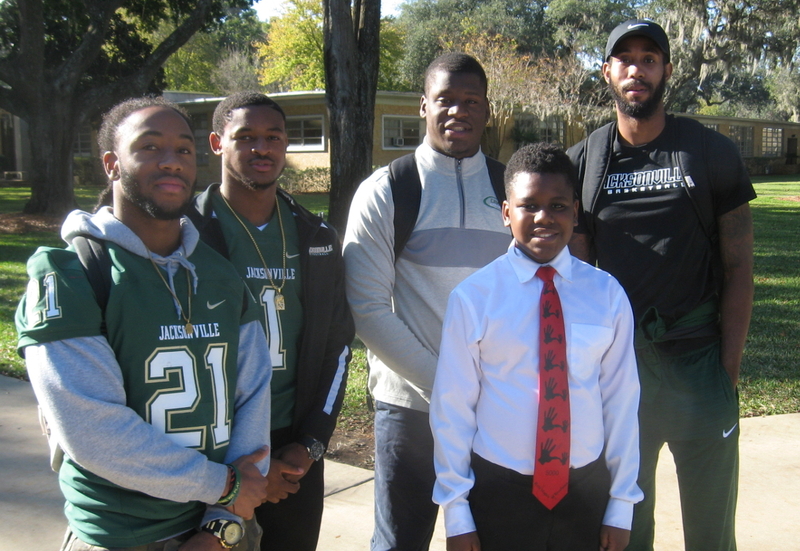 Jasean Armstrong of DuPont Middle School with JU student-athletes (from left, Larenz Scroggins (football), Prince Gray (football), Justin Horton (football) and J.R. Holder (basketball), as part of the 5000 Role Models of Excellence program. 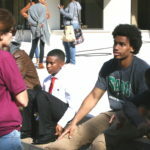 Call it more of a crash course, but the simultaneous 5000 Role Models of Excellence event on campus partnered area sixth-graders with JU student-athletes for half of the student-athlete’s regular day, giving the youngsters a firsthand look at a Division 1 student-athlete’s day-to-day schedule. 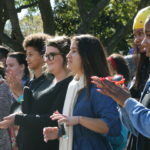 As part of the program, student-athletes carried on with their regular activities, including going to classes, socializing with peers, eating lunch and attending practice if their team was holding it. 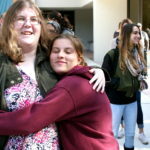 If the student-athlete did not have practice, his middle school students were given a tour of the venue where the student-athlete practices or plays. 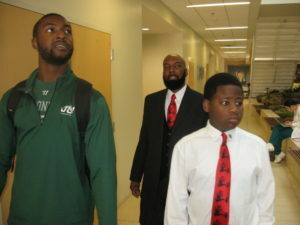 The 5000 Role Models of Excellence students also toured the entire campus and the athletic weight room. “You are giving them a chance to walk it, see it and touch it. Beyond what you can imagine, the fingerprint you are putting on them will last a lifetime,’’ Duval County Public Schools Assistant Superintendent Larry Roziers told the student-athletes. Roziers’ sentiment wasn’t lost on football player Justin Horton. 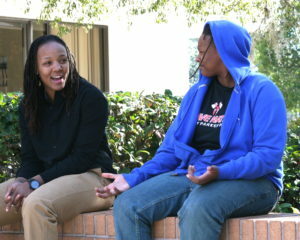 JU lacrosse player E.J. 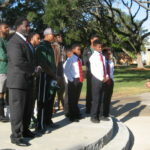 Thurmond said he was honored to represent the school to the kids. 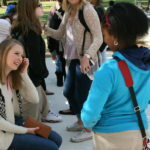 The middle-schoolers were excited to be on campus but didn’t seem too sure what to expect.